Our elected officials “snuck” one in on all of us…how many more? 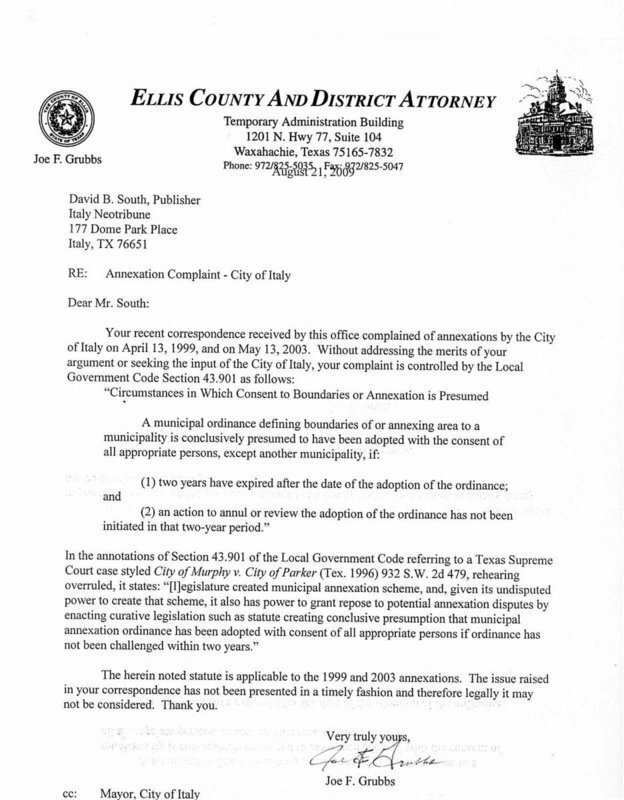 What a surprise, what a big surprise to get this letter from Joe Grubbs, county attorney. It turns out the way I read it, any municipality can enact illegal annexations or probably anything else within the city and if it is kept quiet and no action is filed against it within two years; it is automatically beyond any action. In other words, the illegal annexations that were carried out by the City of Italy are now legal. Where is the oversight? Neotrib wrote about these annexations immediately after they were done but did not file an action. It did not seem necessary. Why do we have a county attorney if their job isn’t to review these actions as they occur? Certainly no private citizen can be expected to file actions or even follow up. These illegal annexations are seriously impinging on the rights of the property owners for half a mile on either side of the roads that are involved. They now have to follow City of Italy rules if they wish to sell their property. What a shock this letter is. It simply tells us that if some government ordinance is not challenged within two years, the ordinance stands. And that these ordinances are obviously not reviewed for correctness. It would really be interesting to know how many of the ordinances are slipped through by this exact same procedure. I for one have had a huge hit to my faith in the checks and balances that are obviously not working here. Plus what does it say for the sneaky tactics of our city administration. We should be very proud of them. The code is too clear to say it was a mistake. And if it was a mistake why not rescind and correct the mistake. Why was it done in the first place? Was it to give more miles to write tickets on? I personally apologize for taking so long to catch on. I now know that the city council can pass and ordinance and if it isn’t challenged within two years then it stands. My assumption is this applies to the new mayor salary as well – that obviously did not fit in the code.